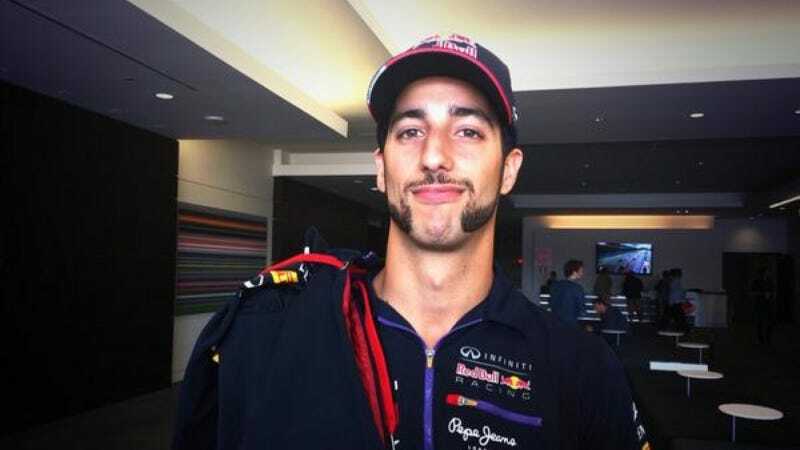 With the demise of Jordan Taylor's groovy mullet, Daniel Ricciardo has graciously stepped in to fill the "racing drivers with 70s hairdos" void. Look at those sweet mutton chops. Look at them. Look at them and weep tears of joy. If Daniel's not making an appearance in the possible Dazed and Confused sequel, perhaps he should be. They've been looking for retro extras all over central Texas lately, even rounding up a few friends' classic cars to appear in the background. Just don't hit on our high school chicks. Clearly, more drivers need awesome hairdos. Seriously, is there any doubt that Kimi would look better with a mohawk? Nope? Nope. Photo credit: Lotus F1 Team.